Students in Loyola University New Orleans’ digital filmmaking department recently spent an evening on the set of the feature thriller “Parker,” studying the workings of a major theatrical project as cast and crew filmed exterior action scenes on the banks of New Orleans’ Bayou St. John. Directed by Oscar-winning director Taylor Hackford, the film stars notable celebrities Jason Statham, Nick Nolte, Jennifer Lopez and Michael Chiklis, as well as veteran actors Patti Lupone, Emma Booth, Wendell Pierce and Clifton Collins Jr. Scheduled for release in October 2012, the movie will wrap in New Orleans this month and relocate to Palm Beach, Fla., for final production. 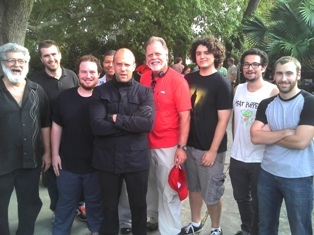 The Loyola students were hosted by Hackford, first assistant director Julian Wall and second assistant director Bill Purple. The field trip was part of the curriculum for their “Writing/Directing for New Media” class, taught by College of Music and Fine Arts artist-in-residence, Jim Gabour. “Parker” is based on the character created by Donald E. Westlake, who under the pseudonym Richard Stark, produced a number of books with Parker as a main character. For the movie adaptation, the film’s title character was dropped into new adventures in a script by John J. McLaughlin, who co-wrote “Black Swan.” Hackford, known for such films as “Ray,” “Officer and a Gentleman,” “Dolores Claiborne,” and “Devil’s Advocate,” said he thought "Parker" was the perfect project for his break into the film noir genre. Loyola’s three digital filmmaking courses are administered under Music Industry Studies, but also count toward a film and digital media bachelor’s degree and/or a film studies minor. For more information, contact Jim Gabour at jgabour@loyno.edu or 504-865-2720.